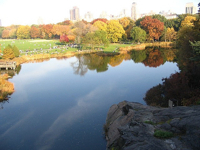 The New York Times reports that the vendor selected in Oct. 2004 to put Wi-Fi in several parks must compete the Central Park job by July, others by late summer: The company, Wi-Fi Salon, is quoted in the article as sounding less sure about the deadline than the city is. Wi-Fi Salon won a bid after Verizon backed out for Battery, Central, Flushing Meadows-Corona, Pelham Bay, Prospect, Riverside, Union Square, Van Cortlandt, and Washington Square Parks, and Orchard Beach in the Bronx, the article notes. So far, Wi-Fi Salon has put service in place only in Battery Park. Their plan has to been to find sponsors to foot the bill and provide the $30,000 per year minimum required in the contract. Future contracts will require no revenue to be paid, apparently. The article notes that NYC Wireless has put Wi-Fi in a number of parks over a number of years, and was selected to unwire the Dag Hammarskjold Plaza in conjunction with a non-profit associated with the plaza. Interesting, other coverage of this story seems to state that the city has just approved Wi-Fi for Central Park. For instance, the BBC reports that the city "announced plans." Their story (and many similar ones) make it sound like corporate sponsorship is already lined up. They say the Parks Departments "says that by July" service will be in place rather than the facts, which is that this is a vendor deadline.